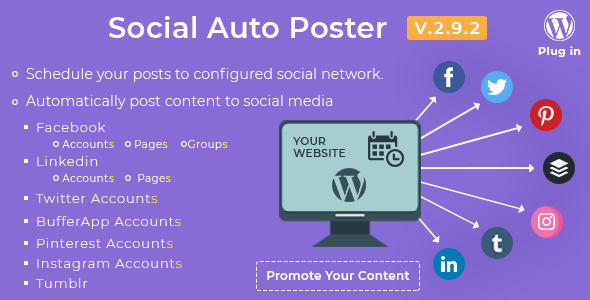 Social Auto Poster WordPress Plugin lets you automatically post all your content to social networks such as Facebook, Twitter, LinkedIn, Tumblr, BufferApp. Social Auto Poster WordPress Plugin Nulled is a perfect choice for auto posting your content to famous social media platforms like Facebook, Twitter. Linkedln. Tumblr, Buffer App. Instagram and Pinterest You can configure your social accounts and post new content as well as repost your old content to keep it alive & reach maximum audience. SAP provides an amazing feature for scheduling your content to post whenever you desired. The plugin also works well with personal profiles, business pages, groups, etc. Social Auto Poster WordPress Plugin do not post to the Google+ social network. Allow auto-posting new posts to configured social network.Ability to choose which post type you want to post.Ability to post content on all your linked Facebook Accounts.Ability to shorten long URL into a tiny URL.Schedule your posts to configured social network. Alternative Torrents for 'Social Auto Poster WordPress Plugin'.